This week on Brooklyn Nine-Nine, Gina Linetti finally leaves the show as a series regular while I rejoice in this blessed event. The episode begins with Gina calling a meeting despite numerous members (like Captain Holt) of the squad being extremely busy. She announces her two weeks notice, much to the confusion of many of the 99 gang. She then performs a four movement dance that highlights aspects of her personality. The “four movements” relates to the episode’s theme, as Gina teaches various lessons to the entire squad or shares a special moment with them (excluding Hitchcock, Scully, and for some reason Rosa). First up is Captain Holt, albeit inadvertently. It’s revealed that Gina and Holt have been teaching each other chess and the art of trash talk for the last few years (I’ll let you guess who’s teaching what). In the matches Holt raises concerns about Gina’s lack of plans for leaving. Gina counters (after losing game after game of chess) that life is chaotic and you can’t plan for everything, an example being Holt’s plan for being NYPD commissioner falling through (temporarily I hope). This is the only part of the episode I truly enjoyed, and featured surprisingly sound advice from Gina. Next up is Amy (with Rosa tagging along). Amy is very emotional about her “friend” leaving the squad, turning Gina off so she helps Amy become more detached and less Amy. The method to do so was to burn the book of Gina’s tweets that Amy made (something Gina wanted before she died). Unable to do so, Amy learns the lesson to always be herself and not be someone else. The problem here is that Amy has always been unafraid to be herself even with the mocking of Gina and sometimes Rosa. Plus, if that was Gina’s lesson, why has she been mercilessly mocking Amy for her quirks all these years? 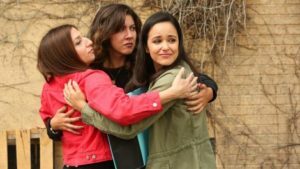 Just another example of Gina always being proven right by the writers even though she’s a huge jerk. Amy and inexplicably Rosa tear up and the three share a group hug. Third movement: Jake. He and Gina pretend to be spoiled rich kids to gain access to an exclusive club for the going away party. The lesson was that Gina just wanted to have a drink with her friends at Shaw’s. Jake learned this lesson when he and Gina turned Mario Lopez away from the party, after Gina spent an hour begging him to come. Fourth movement: Charles and Terry. Gina first gives Charles the Boyle family mead, and the two share a genuine moment and profess their platonic love for each other. Terry is upset that Gina didn’t spend any time with him over the past two weeks, and he speculates that she’s got cold feet about leaving as she spends the next few days at the 99 with excuses, and then flat out admitting she’s scared. However, that’s a front, as she was really waiting for her statue (a bronze one of her on her phone) to arrive. She leaves the squad a video message explaining that, and asks for a five-minute ovation. Because of course she does. Goodbye Gina, I will not miss you. Gina and Jake pretending to be spoiled rich heirs.